Going to open your new office? Or already have an office but need an online presence? Or need a website for personal business? But don’t have any idea how to develop one? Then you have come to the right place! “Office” is a powerful responsive multipage Bootstrap website template for showcasing your office or business website in a professional and better way! Office is a simple, clean; yet beautifully designed HTML5 template. It is responsive, developed basing on Bootstrap3 CSS Framework. Beautiful icon by FontAwesome and fonts from Google Fonts are used in it and the template is nicely coded and well commented. Use and customize it the way you want. This template is free for personal and commercial use. Please don’t remove the ThemeWagon credit link from this free HTML5 template until you donate. Most of the time we find it hard to get a Free Responsive Multipage Bootstrap Template for using it as a small business website. Of course, a big business owner will not be looking for a free template like this. They will spend at least 2000 USD for their custom Responsive Bootstrap template. So our goal is to make things easier for small and medium businesses like you who are looking for a Free Responsive Multipage Bootstrap Template that works fine. How hard is to find a Responsive Multipage Bootstrap Template? I assume you have an excellent idea to launch your business soon and you are trying hard to get a professional designer and a developer at a reasonable and fair price. Yes, this is because most of them will ask for a high price. As a startup or a small and medium business owner, you will off course want a developer for a fair price. The alternative suggestion will be to use a free responsive multipage bootstrap template like “Office” so that you can have a great website with just changing the text and images. If you find it hard, you can even get help from us! We will eventually publish an article in our Blog about How to Change the Text and Images of a free template! 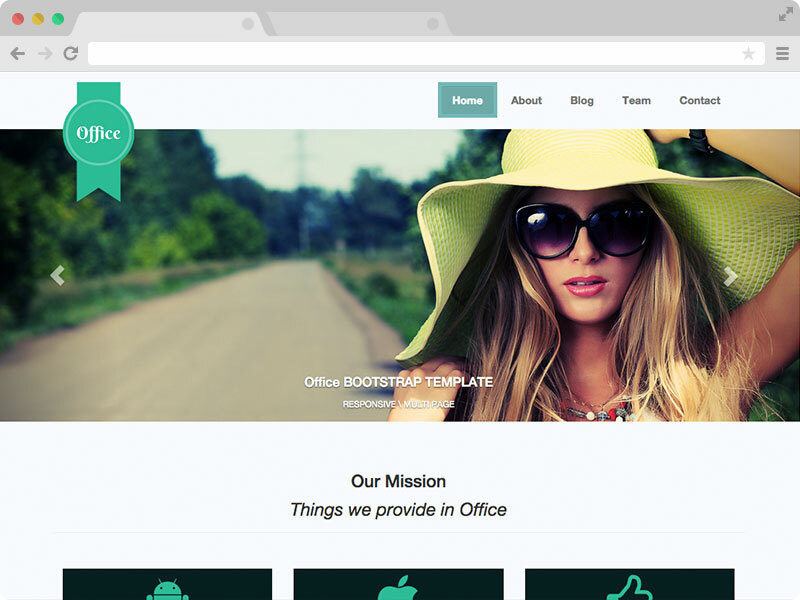 The office is a free bootstrap template. It has well-documented code with page titles, meta description, etc. So you will find it very easy to customize the content of this free responsive multipage bootstrap template. Just replace the images and texts with your own. Also, this is an SEO friendly multipage bootstrap template, so the search engine will be able to index your great business quickly. We highly recommend you to use this multipage bootstrap template. If you find this template useful, don’t forget to buy us a coffee. There is a bunch of more excellent Free Responsive HTML5 Bootstrap Website Templates and Responsive Bootstrap Themes in Themewagon. My expectation was high about this template. But this is average. Is this theme available for WordPress? I built a website using this template and I like the blog part of the html site but it would be real nice to integrate a real blog into to make that page work right. Thanks for sharing the theme with us. how to keep a sub-menu on hover? Greetings from Themewagon and thanks for downloading. We are sorry for your inconvenience. Please download it again. The problem is solved now.